“…Yes, the way Mr. Hitchcock folds suggestions very casually into the furrows of his film, the way he can make a torn newspaper or the sharpened inflection of a person’s voice send ticklish roots down to the subsoil of a customer’s anxiety, is a wondrous, invariable accomplishment. And the mental anguish he can thereby create, apparently in the minds of his characters but actually in the psyche of you, is of championship proportions and—being hokum, anyhow— a sheer delight. But when Mr. Hitchcock and/or his writers start weaving allegories in his films or, worse still, neglect to spring surprises after the ground has apparently been prepared, the consequence is something less than cheering. 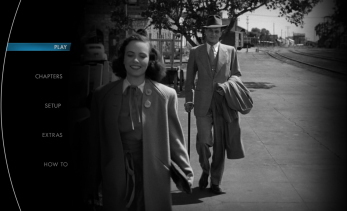 And that is the principal fault—or rather, the sole disappointment—in “Shadow of a Doubt.” For this one suggests tremendous promise when a sinister character—a gentleman called Uncle Charlie—goes to visit with relatives, a typical American family, in a quiet California town. The atmosphere is charged with electricity when the daughter of the family, Uncle Charlie’s namesake, begins to grow strangely suspicious of this moody, cryptic guest in the house. And the story seems loaded for fireworks and a beautiful explosion of surprise when the scared girl discovers that Uncle Charlie is really a murderer of rich, fat widows, wanted back East. But from that point on the story takes a decidedly anticlimactic dip and becomes just a competent exercise in keeping a tightrope taut. It also becomes a bit too specious in making a moralistic show of the warmth of an American community toward an unsuspected rascal in its midst. We won’t violate tradition to tell you how the story ends, but we will say that the moral is either anti-social or, at best, obscure. When Uncle Charlie’s niece concludes quite cynically that the world is a horrible place and the young detective with whom she has romanced answers, “Some times it needs a lot of watching; seems to go crazy, every now and then, like Uncle Charlie,” the bathos is enough to knock you down. One notices immediately that even this mixed review finds a lot to admirer about this gem. It probably didn’t surprise Mr. Crowther when Shadow of a Doubt became a tremendous success at the box office. Shadow of a Doubt has earned its praise and its status as a classic. Overall, this is an extremely attractive presentation and there is very little room for rational criticism. Universal’s 1080P transfer should pleasantly surprise viewers. While picture is sometimes slightly softer than what one might expect, it seems to accurately represent the film’s source. There is a nice layer of grain that seems consistent with the film’s celluloid origins and adds to the overall cinematic experience. Contrast is beautifully handled and exhibit rich blacks and beautiful grays. Detail is surprising for a film of this age and the image seems to be free of any distracting DNR or edge enhancement. There is the occasional bit of print damage, but what can one expect from a film of this vintage? The lossless mono mix included on the disc might show its age, but seems to accurately represent the film’s source elements. Dialogue is always clear and the music benefits from this lossless transfer (though there are moments when Tiomkin’s score suffers in clarity). Laurent Bouzereau’s documentary on the making of this classic film contains many anecdotes from the production of the film and is packed with quite a bit of information. 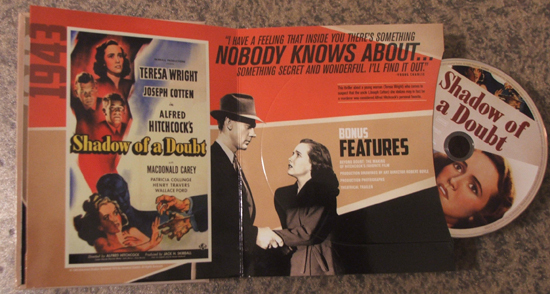 Teresa Wright, Hume Cronyn, Patricia Hitchcock, Robert F. Boyle, and Peter Bogdanovich contribute to the wealth of “behind the scenes” information provided here. Fans should be thrilled to see it ported over for this Blu-ray release. Vintage trailers are always amusing to watch, and this one is typical of what one expects from a trailer of this period. However, one suspects that this trailer was actually used to promote one of the film’s re-releases. This is a collection of Production drawings by Robert Boyle, who served as the film’s art director. Cinemaphiles should enjoy seeing these sketches. A collection of photos from the set of Shadow of a Doubt is also included. 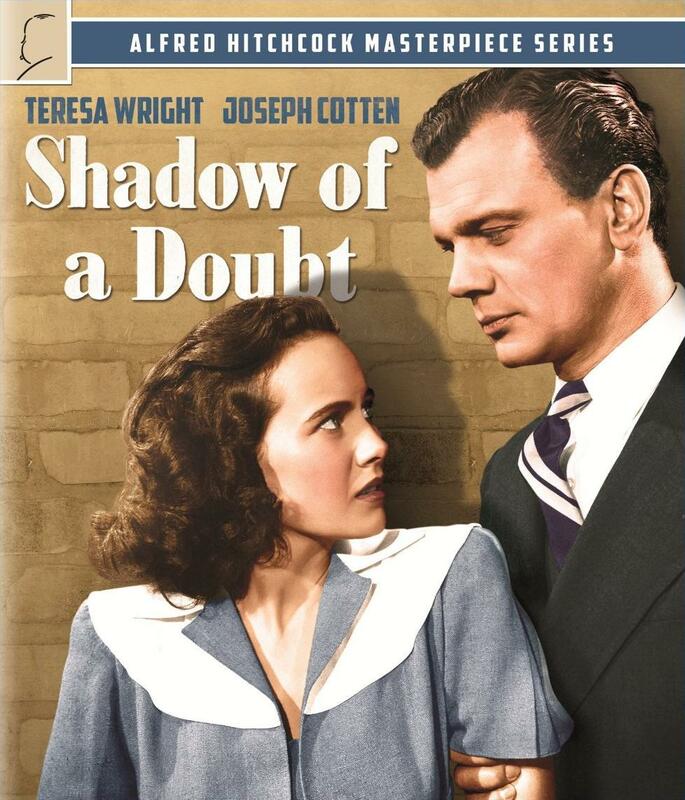 Shadow of a Doubt is one of the director’s best achievements and Universal’s much improved transfer of Shadow of a Doubt makes this Blu-ray release an essential purchase.